With T-Slot Aluminum, you get more value than you ever would with welded steel. Need flexibility? You've got it with t-slot aluminum. Need Versatility? Extruded aluminum has that too. Strong in the hot or the cold, corrosion resistant, extruded aluminum has everything you need to get a project done quickly and efficiently. No need to paint or weld unlike steel parts. Get whatever you need built fast and strong with our metric series profiles of extruded aluminum framing. For thousands of years humans have been fabricating useful, pleasing furnishings and other structures for the home and workplace out of an impressive range of materials, including straw, mud, stone, wood, brick, iron, steel, and other metals of various sorts. But it is only within the last hundred years or so that aluminum—the most abundant metal in the Earth’s crust—has been utilized in an ever-increasing number of day-to-day applications. Partly this is because a cost-effective process for extracting aluminum from bauxite ore was not perfected until about 1920. So there is one great advantage of employing aluminum for structural design purposes: it is plentiful. Its other advantageous properties include strength, lightness, formability, high ductility, and excellent corrosion-resistance. The innate utilitarian value of those properties is vastly magnified when the metal is formed into T-slot aluminum extrusions. In a nutshell, T-slot aluminum forms the basis of a framing system for creating three-dimensional structural assemblies made with a variety of extruded and fabricated aluminum parts. With this system, each length of extruded aluminum contains one or more T-shaped indentations, or “slots,” into which various attachments (with ends also shaped like a “T”) conveniently fit and can slide up and down as needed. This allows you to interconnect other T-slotted aluminum parts into even the most complex configurations without having to clamp and weld them together—as you would have to do with steel components. Here are a few of the key advantages of adopting T-slot aluminum solutions to meet your structural design needs. True, steel is harder and "stronger." But by the same token, aluminum is among the lightest of metals used for modern engineering purposes, with a molecular density one-third that of steel. As a result, it possesses a strength-to-weight ratio that is actually superior to that of steel . Contrary to what you might think, extruded aluminum is strong enough to handle most structural design and assembly applications. Once you factor in the inconvenience of moving and positioning heavy pieces of steel—not to mention the added labor cost of welding or riveting them together, drilling and tapping holes for mounting bolts, and then cleaning, prepping, priming, and painting the surface of the metal—then T-slot aluminum becomes an increasingly attractive option if you are seeking cost-effective structural framing solutions. If it’s tough enough for trucks, military combat vehicles, and commercial airliners, then rest assured that aluminum is tough enough for more prosaic, everyday purposes. One key aspect of this durability is its resistance to rusting. Rust is to steel as rot is to wood. Unlike steel, for all intents and purposes aluminum doesn’t rust at all. A microscopic layer of oxide (which is responsible for the silvery-gray color of anodized aluminum) naturally forms on the surface of the metal and prevents that from happening. You don’t even have to prime and paint it in order to protect it! If any of your project’s aluminum extrusions or other parts never rust, then you’ll never have to replace them—saving you money and down-time in the long run. Finally, one of the most important advantages to using T-slot aluminum extrusions and accessories is that, unlike permanently welded steel, the system is modular by design—i.e., it is easily changeable. You can connect, position, and fasten together the aluminum profiles however you’d like, using the appropriate fasteners , connectors , and desired accessories . Later on, as needed, you can then adjust and rearrange them in any configuration you like. The most common type of aluminum fastener used to fasten parts together is the T-nut: just drop it into the T-slot and then twist it into a locked position. That is so much easier than welding! Once you’ve put the finishing touches on the assembly with end caps, casters, cable blocks, machining jigs, tool hangers, cabinet siding, doors, or any of a number of other accessories that we carry, you’re good to go! For maximum versatility for both both our international and domestic customers, be aware that our T-slot aluminum extrusions come in both metric profiles and inch profiles . From carts to aquarium stands , from shelves to enclosures , and from ergonomic workbenches to eye-catching signs , Framing Tech T-slot aluminum extrusion systems are designed, machined, and assembled for versatility—and they are built to last. 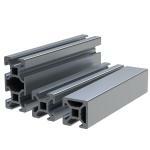 What is T-slot Aluminum Extrusion? T-slot aluminum extrusion is a structural fabrication material that utilizes an engineered cross-sectional profile that is both strong and versatile in its use. Will T-slot Aluminum Extrusion corrode? Our aluminum extrusion is non-corrosive. This is mostly due to the clear anodized finish that comes standard on all of our extrusion, but also due in part to aluminums natural ability to oxidize. The oxidation process creates a secondary layer of protection from corrosion, similar to how copper will patina. 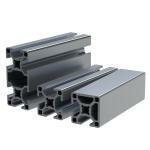 Is T-slot Aluminum Extrusion considered a “Green” material? Yes! Due to excellent recycling practices most of the aluminum ever produced is still in use today. In fact, aluminum is 100% recyclable and of the most common materials recycled aluminum is the ONLY material that is infinitely recyclable. It is also much lighter than glass and steel per cubic inch, and has a much smaller carbon footprint during fabrication, processing, and shipping. 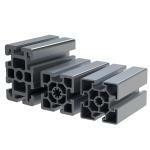 Why choose aluminum extrusion over steel? The main advantages are that aluminum extrusion is more versatile, modular, easier to work with, and costs less than steel. Building with aluminum extrusion is as simple as inserting a connector into the t-slot and tightening it into place with standard hand tools. No need to clamp, weld or paint aluminum extrusion. 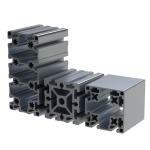 T-slot aluminum extrusion makes it easy to re-locate pieces or add onto your current structure at any time. 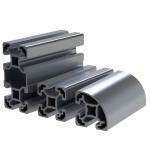 What is aluminum extrusion used for? Currently, T-slot aluminum extrusion is widely used in automation, material handling, safety guarding, manufacturing and laboratory applications. However, many people are adopting t-slot aluminum extrusion for use in a wide variety of projects. Some have even built their own machines such as 3D Printers and CNC machines using our aluminum extrusion. What is a T-slot, and how do I use it? A T-slot is what we call the channel that runs the length of our aluminum extrusion shapes. 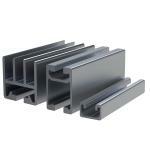 The T-slots are designed to a specific depth and width depending on the material. The T-slot is used mostly for mounting and fastening a wide variety of accessories and panels to the aluminum extrusion. Often, panels will be inserted into the T-slot to quickly create a wall or enclosure.